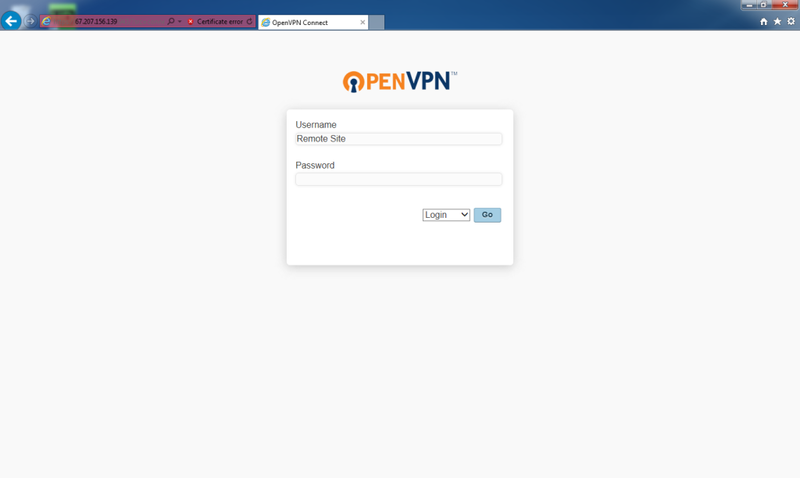 This will configure the server sitting at the remote site to remain persistently connected to the OpenVPN Access Server. You’ll have to be at the site or on the same network as the remote server for this configuration. The certificate error should have been bypassed earlier and not needed again. For Password, enter the password that was entered in “More Settings” for the “Remote Site” user. Click the Yourself (autologin profile) link under Connection profiles. When prompted, Save the file. Save it in your Downloads folder. the “.ovpn” extension should be added. 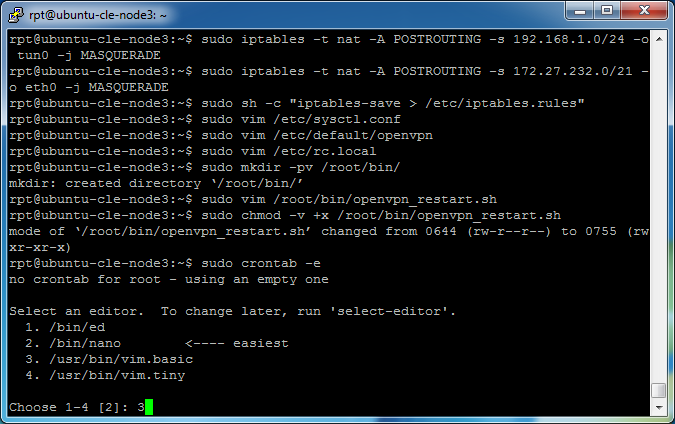 For Host Name (or IP address), enter the IP address to SSH into the server. In this case: 192.168.1.245. Logon to the server. This information is setup at installation time or provided by your provider. 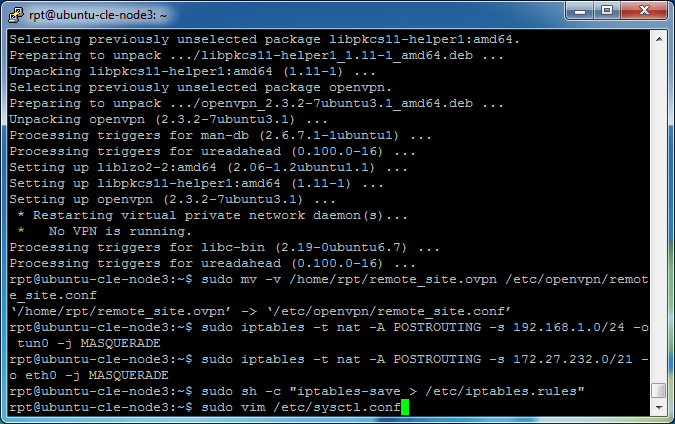 For a description of this command see the Bridge Server – Download and install OpenVPN Access Server section. This may take some time depending on the updates that need to be applied. 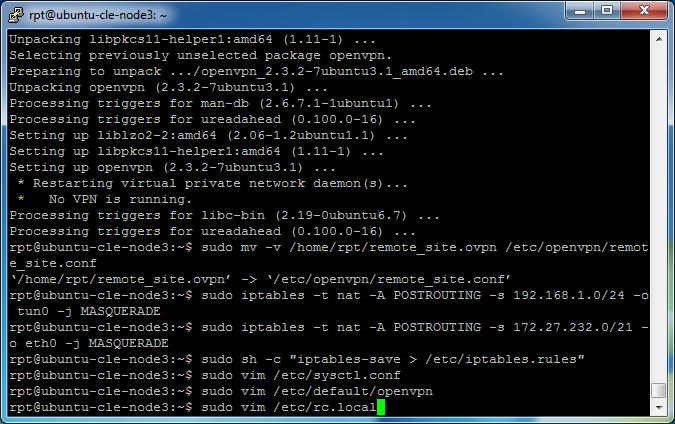 Install a text editor: vim (not required), SSH server (possibly already installed), and openvpn. 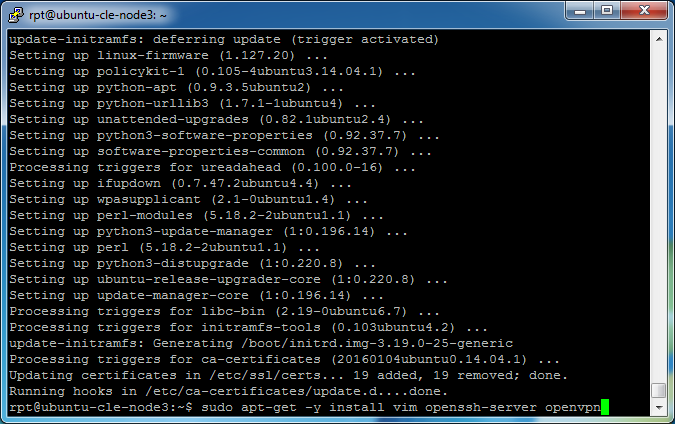 sudo: runs the package manager as the superuser to avoid any permission issues. apt-get: is the name of the Debian package manager executable. -y: with this option, apt-get automatically assumes the default answer to any apt-get prompts. install: download and install the specified package(s). 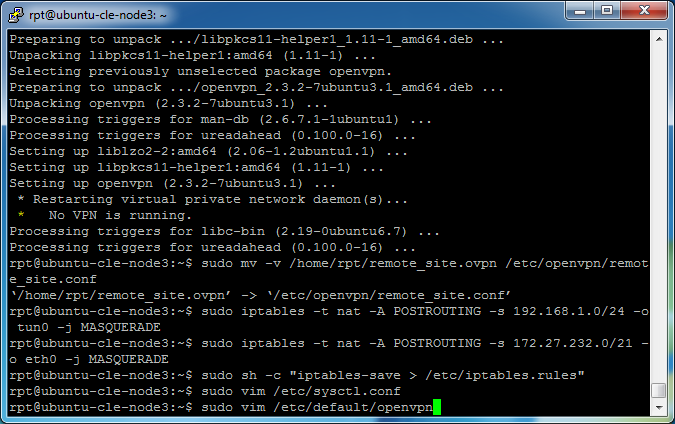 vim, openssh-server and openvpn: the name of the package(s) to be installed. Connect to the server. In this case Host: sftp://192.168.1.245, enter username and password. 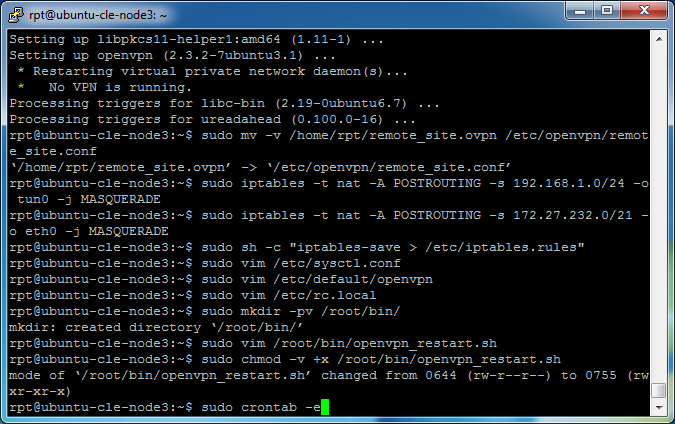 Locate the local directory where the remote_site.ovpn file was downloaded. 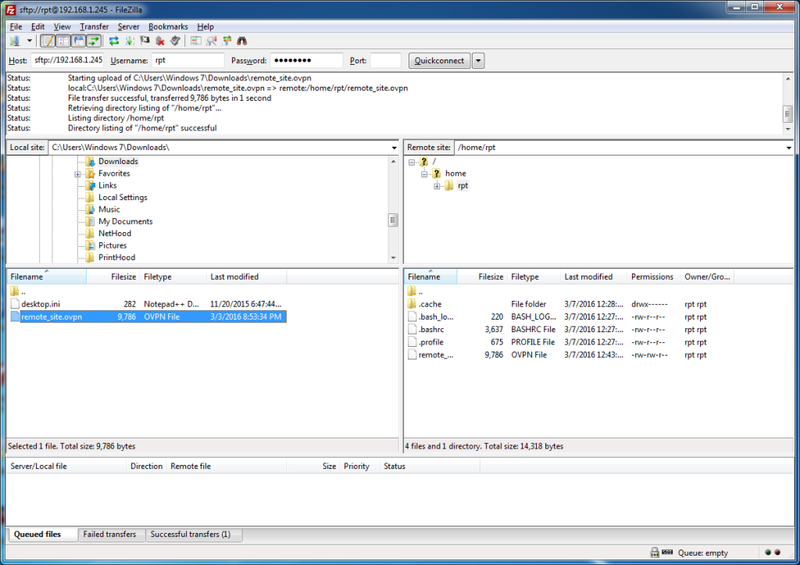 In this case the Downloads directory. 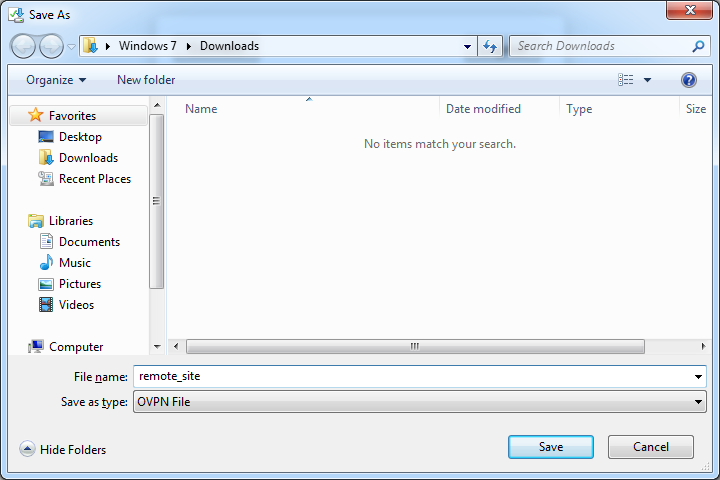 Drag-and-drop the remote_site.ovpn file from the Local Site file listing to the Remote Site file listing. The directory will be something like /home/username on the Linux machine. This will upload the file to the Linux machine. Note: the OpenVPN profile file can be downloaded directly to the gateway server if a GUI is available instead of transferring it from another computer. 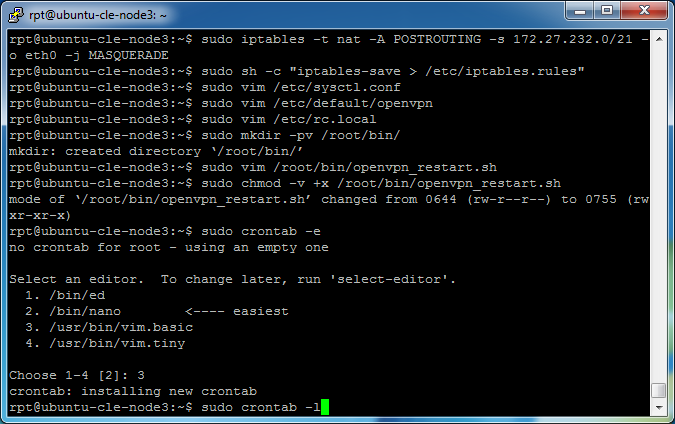 These commands need to be run as root to avoid system permission issues. Notice the extension changes from .ovpn to .conf. The OpenVPN service automatically starts connections but requires the .conf extension. sudo: runs the packet filtering administration tool as the superuser to avoid any permission issues. 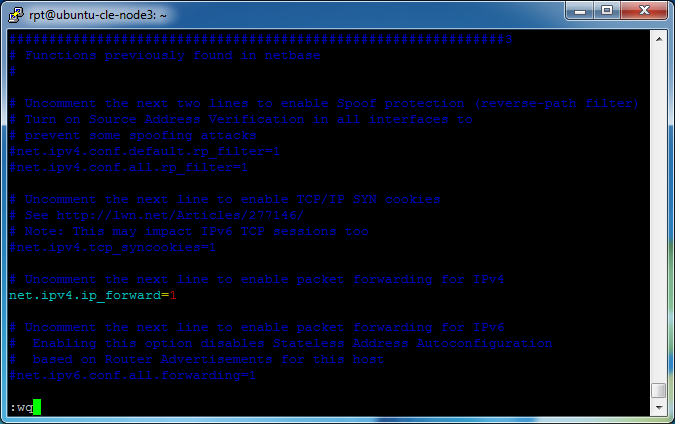 iptables: packet filtering administration tool. -t: specifies the packet matching table for the rule. nat: the modified table is the Network Address Translation (NAT) table when a new connection is encountered. -A: append the rule to the specified chain. POSTROUTING: chain that modifies packets as its about to be send out. -s: specify source ip address/mask. 192.168.1.0/24: network prefix and subnet mask of the remote site network. Check the links in the Remote Site User Configuration section if unfamiliar with this. 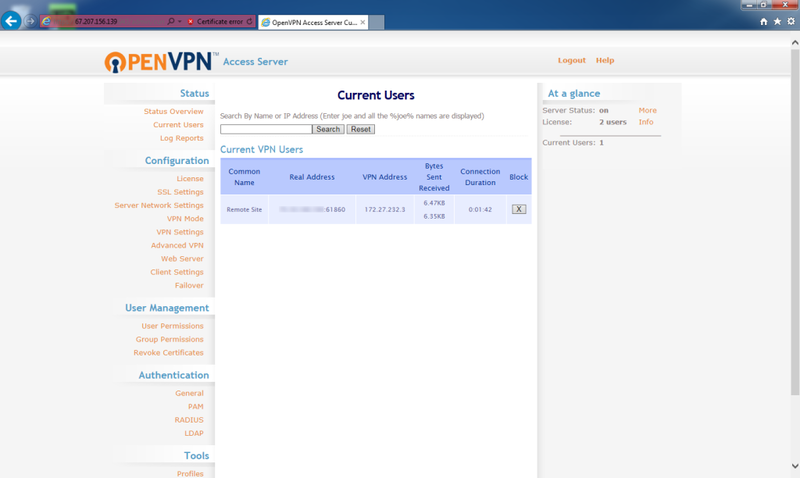 172.27.232.0/21: network prefix and subnet mask of the VPN tunnel network. -o: output interface to send the packet originating from -s.
tun0/eth0: network interface. tun0 is the VPN, eth0 is the wired Ethernet interface. -j: action to take when the packet matches. MASQUERADE: replaces the sending IP with the router IP in the packet. These Firewall rules are only active until the system is rebooted. We will save the new rules and restore them on reboot. IF COPY & PASTING this line, replace the quotes as bash doesn’t recognize the ones the browser renders. 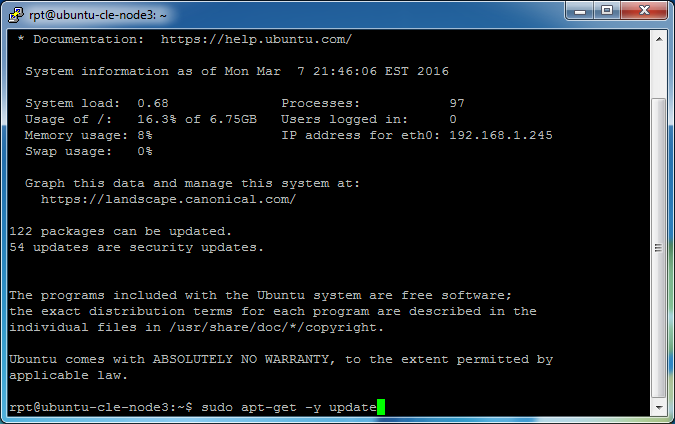 sudo: runs the command interpreter as the superuser to avoid any permission issues. -c: reads the entire command from the quoted string. iptables-save: dumps current iptables rules. >: where to write the rules. /etc/iptables.rules: filename the rules are saved to. Place the cursor over the “#” (comment indicator) and press the “x” key to remove it. “rc” stands for RunCom or run command. “rc.local” are custom commands executed when the runlevel (mode of operation in Linux) changes. Press the Escape key to take VIM out of insert mode. Upload openvpn_restart.sh or create it in the text editor. # Install in /root/bin/ (create if ‘bin’ doesn’t exist). IF COPY & PASTING this code, replace the quotes as bash doesn’t recognize the ones the browser renders. 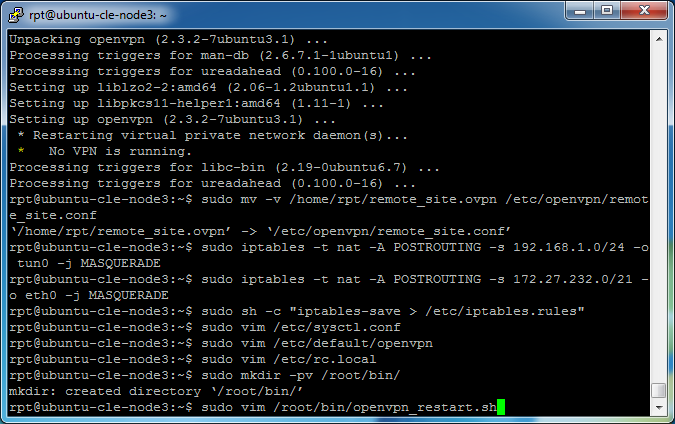 Instead upload this script with the name openvpn_restart.sh. 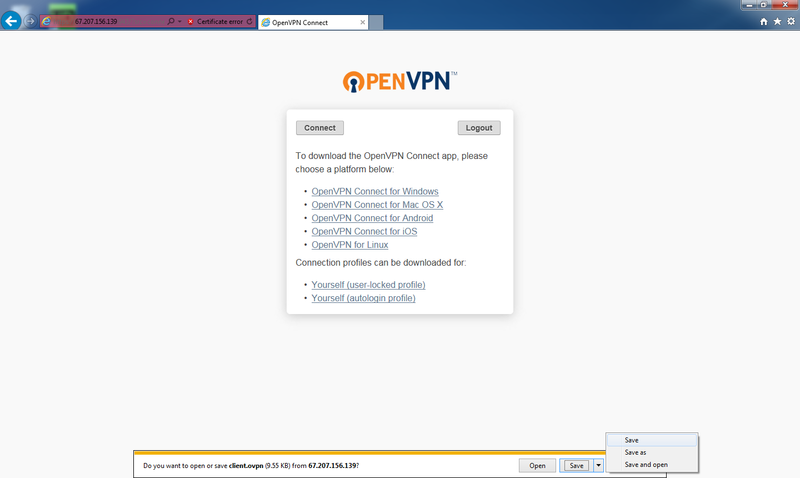 Using the free version of OpenVPN Access Server is only limited to two licenses as mentioned above. 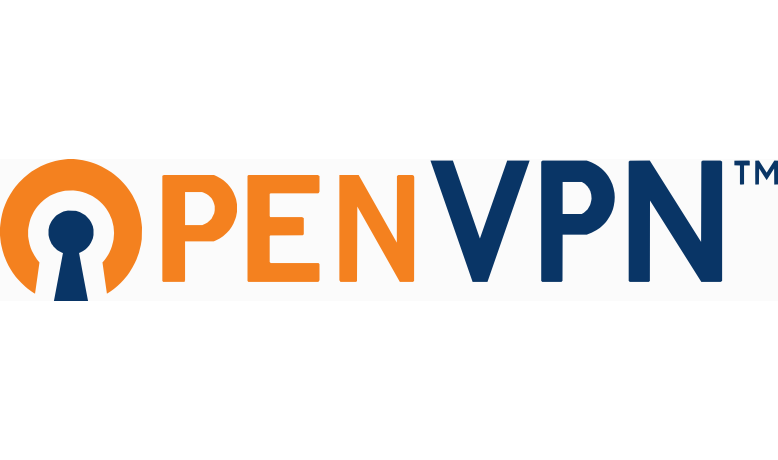 If the connection is interrupted and the bridge server replies with ‘too many concurrent connections,’ the OpenVPN service would die and no longer attempt to reconnect. Likely due to the remote client seeing the connection drop but the bridge server not realizing the previous connection was terminated. This would cause an obvious problem because that meant a manual reboot or manual restart of the OpenVPN service. I’m trying to avoid trips to the remote site!! This script checks for the presence of the tun (tunnel) network interface. If it doesn’t find it, restarts the OpenVPN service triggering a reconnect attempt. 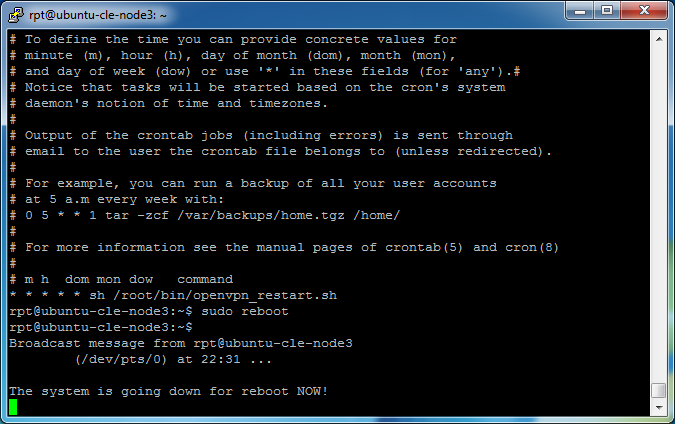 Cron (Linux scheduler), it will run as often as you would like. You can enable logging in the script if you wish. Notes are in the script comments. After the reboot, you should now see the Remote Site connection on the status page of the Bridge Server (Admin login and click Current Users). The Remote Site configuration is now complete!